System level notifications in Bamboo are triggered by a small range of system level events. This means that you don't need to configure these notifications for each plan you are running, as they are applied globally across the Bamboo platform. 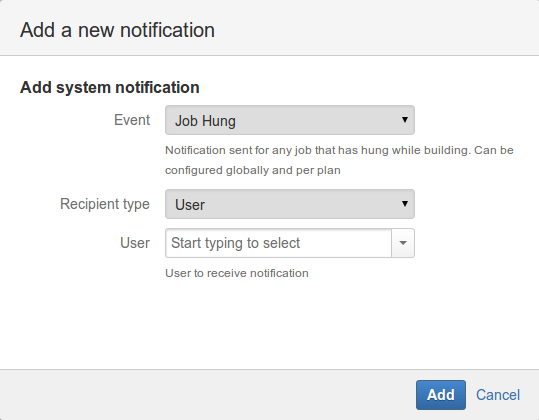 Job Hung — Bamboo will send a notification whenever it determines that one of the plan's job builds has hung, according to the hung job build criteria (read more about configuring your hung job build settings). Job queued without capable agents — Bamboo will send a notification whenever one of the plan's job builds is queued and there are no agents capable of building it. Job queue timeout —Bamboo will send a notification whenever one of the plan's job builds has been waiting in the queue for longer than the build queue timeout criteria (read more about configuring your job's Build Queue Timeout settings). 受信タイプ User — Enter the username of the appropriate Bamboo user, or click the icon to select from a list of users. Group — Enter the name of the appropriateBamboo group(s). Click Add to confirm your configuration. Click the pencil symbol in the Actions column to edit the notification. Click the cross symbol in the Actions column to remove the notification.